The Rings fit! 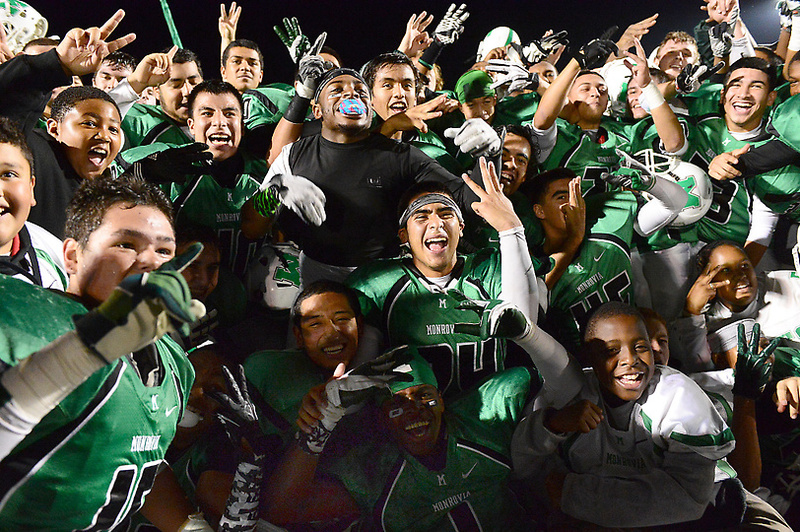 Monrovia, Rio win CIF-SS titles…is a regional berth next? Monrovia and Rio Hondo Prep believed they were the best teams in their respective divisions and showed it Friday, each beating top seeds to win CIF-Southern Section titles. For the Wildcats, it’s their third consecutive Mid-Valley crown to become the first area team since Temple City in 1978 to three-peat, beating Paraclete, 23-7. Rio Hondo Prep added to its already crowded CIF-SS title trophy case, winning title No. 14 with a 28-21 win over Mission Prep, which handed the Kares a 47-14 defeat in August. Now comes the question have the two earned spots in the regional bowls, slated for next week. I believe they have, CIF decides Sunday. 3PEAT! : Monrovia celebrates their CIF-SS Mid-Valley football championship as they beat Paraclete at Monrovia High School Friday night. Move over area coaching legend Bob Hitchcock and Temple City, you have company. Ge Vontray Ainsworth rushed for 132 yards and a touchdown and host Monrovia held Paraclete to 124 yards to become the first area team to win three consecutive CIF-Southern Section titles since Temple City in 1978 with a 23-7 win Friday over the Spirits for its third straight Mid-Valley Division championship. The Wildcats, which held usually productive Paraclete to nine yards rushing and three first downs in the second half, improved to 12-2 and could be selected for a CIF State regional bowl when pairings are announced on Sunday. Paraclete, seeking its third division title since 2008, finished 12-2. Monrovia’s George Frazier V: “We just made adjustments to what they were doing. They came out and did things they hadn’t done all year. But we’re a second-half team. BACK TO BACK CHAMPS: Rio Hondo Prep reacts after beating Mission Prep 28-21 to win the CIF-SS Northeast Division championship football game at Rio Hondo Preparatory School on Friday. The CIF-Southern Section Northeast Division championship still belongs to Rio Hondo Prep High School. Considered by many to be sizable underdogs on Friday night against Mission Prep of San Luis Obispo – the team that blew out the Kares back in August – host Rio Hondo Prep got sweet revenge with a 28-21 win to repeat as division champion. Running back Nate Tayco ran for 178 yards to lead the Kares, who improved to 12-1. Mission Prep, which beat Rio Hondo, 47-14, in August, finished 11-2. The Kares won the division for the second consecutive season to win the program’s 14th CIF-SS title, tops in the area. They will find out Sunday if it gets them a CIF State Regional Bowl berth. MONROVIA – If you can’t beat ’em, join ’em? “He’s physical on defense,” Monrovia coach Ryan Maddox said. “He might be better on defense than he is running the football. He’s an all-around, exceptional football player. “He does what we ask him to. That might be the best part of what he does. He came (here from Covina), and you’re always worried about how a guy will fit in. But he’s been a coach’s dream. He will do whatever it takes for this team to win. THE MISSING PIECE: Rio Hondo’s Nate Tayco is a big reason why the Kares will play for a second consecutive CIF-SS Northeast Division title against Mission Prep on Friday. ARCADIA – Rio Hondo Prep, after winning the CIF-Southern Section Northeast Division football title last season, entered the fall thinking repeat. The Kares had most of the necessary parts back, including quarterback Colby Rivera, receiver Jake Holguin and a good chunk of the defense that helped Rio Hondo win 13 of 14 games and the division title. The question mark was in the backfield. Enter Nate Tayco, who has had all the answers. The junior has filled the void left by older brother Alex Tayco and has the Kares in position for back-to-back titles when they host Mission Prep at 7 p.m. Friday. “I didn’t want to be a question mark,” Nate Tayco said. “I think I handled that pretty well. For some, Nate Tayco has at the very least matched Alex Tayco, who earned Northeast Division Offensive Player of the Year after leading the Kares to a 13-1 record and a division title. Nate Tayco solidified the Kares’ rushing attack, running for nearly 1,500 yards and scoring 25 touchdowns. He has rushed for 562 yards and nine scores in the postseason, including 246 and three touchdowns in a 42-14 victory over St. Monica Cathedral in last week’s semifinals at Santa Monica College. 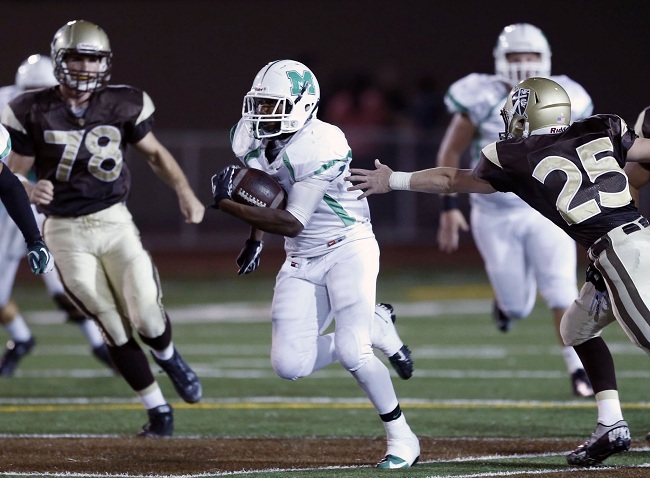 CIF Regional Bowl Games: Is it win or you’re in for Monrovia, Rio ? That depends on who you ask…. Monrovia and Rio Hondo Prep will be looking to add to the CIF-Southern Section championship showcase Friday when they each play in division title games. Monrovia is seeking its third consecutive Mid-Valley title, while Rio Hondo Prep is seeking its second consecutive Northeast championship and its 14 CIF-SS title overall. Both are also in the running for region bowl bids. Cal-Hi Sports believes if both win, their in. 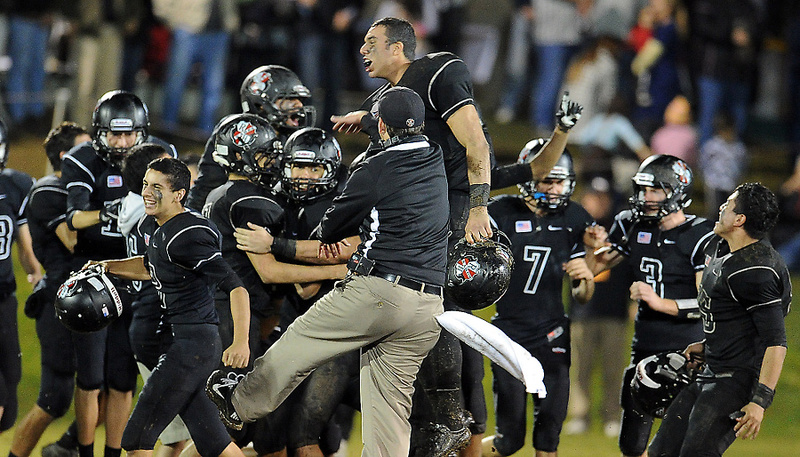 Max Preps believes each will be a little more. If both teams win on Friday, they’ll find out their fate on Sunday when pairings for the five region bowls are announced. Drops: Previous No. 7 Laguna Beach lost to Garden Grove 35-21; No. 8 San Dimas lost to Paraclete (Lancaster) 28-20; No. 9 Mission Oak (Tulare) lost to Bakersfield Christian 7-0; No. 10 Brawley lost to Madison (San Diego) 35-18. Bubble Teams: Banning 11-2*, Brawley 10-2*, Jurupa Hills (Fontana) 8-4*, Laguna Beach 11-1-1*, Mission Oak (Tulare) 9-3*, San Dimas 11-2*, San Marino 10-2**, Salesian (Los Angeles) 11-2*, Valley Center 7-5*. *Indicates season complete and ineligible for CIF bowl game. **Indicates forfeit loss not included plus season complete, ineligible for bowl game. No. 1 Team Result: Paraclete defeated San Dimas 28-20 in CIF Southern Section Mid-Valley Division semifinals. Cal-Hi Sports Projected Bowl Game Matchup: CIF-Southern Section Mid-Valley Division winner (Paraclete or Monrovia) vs. CIF-San Diego Section Division IV winner (St. Augustine or Madison). *Indicates season complete, ineligible for CIF bowl game. Drops: Previous No. 9 Christian (El Cajon) lost to Francis Parker 27-24. Bubble Teams: Boron 10-2*, Calipatria 9-3*, Christian (El Cajon) 8-4*, Flintridge Prep (La Canada) 6-5*, La Jolla Country Day (La Jolla) 7-4*, Windward (Los Angeles) 5-4*. *Indicates season complete, ineligible for bowl game. Cal-Hi Sports Projected Bowl Game Matchup: Ontario Christian (if it were to win CIF-SS East Valley title) vs. CIF-SS Northeast Division champion (Mission Prep or Rio Hondo Prep). 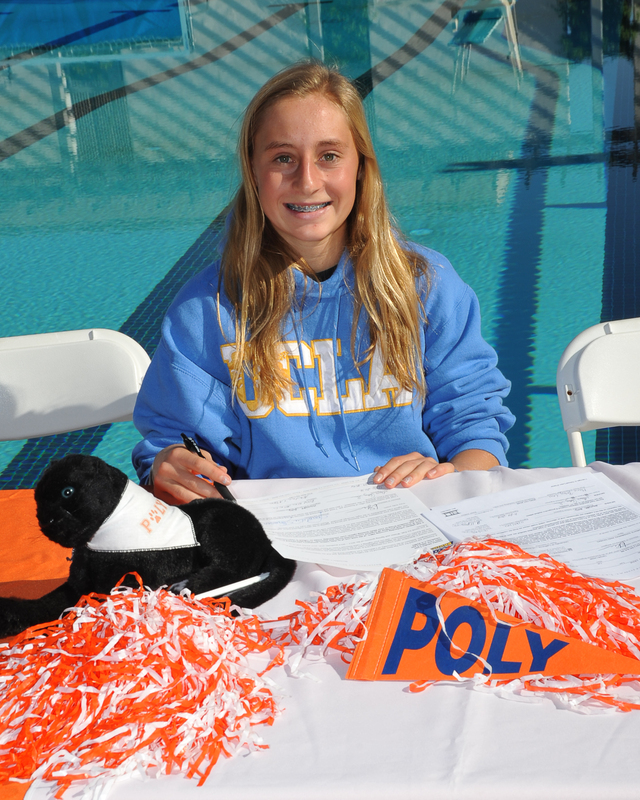 Pasadena Poly’s Annika Lenz, who will be seeking her fourth CIF-Southern Section divisional diving championship in the spring, signed with national power UCLA recently. Lenz has won three consecutive CIF-SS divisional titles. Her member of her family has won a CIF-SS title each of the past six years.